Leslie Brodhead is a contributor to Writers on the Range, the opinion service of High Country News. She is a writer in Nederland, Colorado. Row upon row of blackened trees stood in front of it, burnt trunks to the right and left. There it stood as if nothing had happened. As I looked at the scorched earth beneath my feet, it seemed impossible that the orange stucco house had survived untouched by a single flame. How could it still be standing? June is often one of the hottest and driest months in my part of Colorado, and brings about a spate of wildfires. We were evacuated from our house less than a year ago — wondering each day whether we'd have a home to come back to — and so the risk of wildfire is never far from my mind. As I drive the roads of our small mountain community, I’m shocked at the number of people I’ve talked to who seem to shrug their shoulders about their role in preventing wildfire. These are people who came within yards of losing their home, and yet they still hold out to save a few meager pine trees bordering their front porch. If a 600-acre wildfire coming to your doorstep isn’t enough to shock you into the reality of the importance of cutting down trees close to your house, I don’t know what will. Six weeks after we moved to Nederland, Colorado, the most destructive wildfire in Boulder County’s history wiped out over 160 homes. My husband made jokes that we had officially moved into the “fire pit.” But it was a huge wake-up call to us about what we needed to do to make our home as fire proof as possible. We went to presentations given by wildfire mitigation specialists, taking copious notes about defensible space. But what, exactly, did that mean? 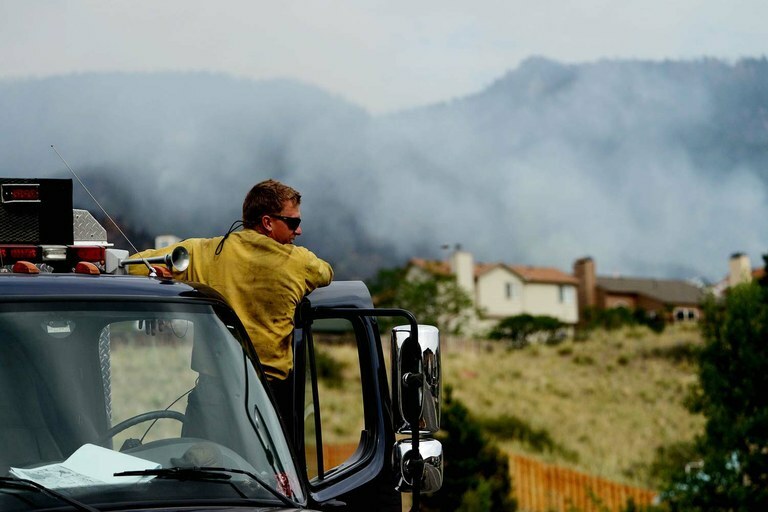 Vandenberg Air Force Base Hot Shot fire fighter Richard Strange looks out at his worksite for the day on June 28, 2012 in the Mount Saint Francois area of Colorado Springs, Co. It meant clearing a 30-foot buffer of all vegetation around our home and seriously thinning the trees beyond that. But I moved here to live among the pines and firs of the Rocky Mountains. If we cut all the trees down, what would be left? Cutting those first few trees didn’t seem so bad. But there was one mature lodgepole pine near the corner of our driveway — a beautiful, healthy pine — that I was attached to. And one day when I came home from work, it was gone. My husband and his father had cut it down. My wonderful tree, lying in pieces along the driveway. Things got really serious when we decided to host a Saws and Slaws event at our house. Saws and Slaws is a community fire-mitigation event rather like an Amish barn raising in reverse. Rather than putting wood up, a group comes to your property to cut down trees and haul slash to help with fire mitigation. More work is done in one day than we as a couple could do in a year, at no cost to the home owner other than the responsibility of hosting the “Slaws” potluck barbecue after the work is done. Despite cutting down more than 150 trees from our two acres of land, we still have forest to gaze upon. Clearing the trees improved our views of the surrounding mountains, with gaps to see those rugged peaks. During the drama of the Cold Springs Fire a year ago, I found comfort in knowing we had done pretty much all we could do to make our house safe for firefighters to defend it. I love living in the mountains and looking at the forest with a backdrop of snowcapped peaks. It’s what drew me to making a home here. But I also believe that the inhabitants of what’s now known as the Wildland Urban Interface have a responsibility. It’s our responsibility to work together with local residents, the government and private organizations to build a community that is as protected from wildfires as possible. As private homeowners, we must take the first steps and be the example to those around us. It’s past time to cut, haul and create that defensible space around vulnerable houses. Anyone who doesn’t isn’t just putting themselves at risk, they’re threatening neighbors and an entire community. To survive in this beautiful but fragile environment, all of us have to work together to do the right thing.